The CDECK Composite Deck Screw Assortment kit is the perfect accessory for your home, garage or workshop. Fully loaded, this take-anywhere kit is easy enough to carry & slim enough to fit just about any place you need. The ultimate composite deck screw assortment kit! If your a deck installed you'll want one of these available whenever your on a service call, save time, save money. (CDAK Shown) This economical and compact assortment kit is the perfect accessory for your home, garage or workshop. Fully loaded, this take-anywhere kit is easy enough to carry & slim enough to fit just about any place you need. 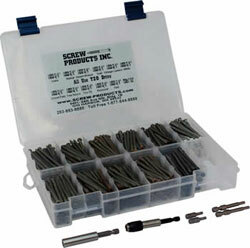 The ultimate composite deck screw assortment kit!